The United Nations Human Settlements Programme (HABITAT) Regional Office for Asia & the Pacific www.fukuoka.unhabitat.orgopened in Fukuoka City in August 1997. It was tasked by HABITAT Headquarters in Kenya to strengthen regional level projects and activities. Fukuoka Prefecture, the City of Fukuoka, and the private sector were all keen to invite the regional office to Fukuoka, where it is completing its first decade. One of UN-HABITAT’s major activities is technical cooperation. It helps to improve living conditions as well as to restore areas devastated by war or disaster in developing counties. A core activity of the organization is formulating policies on sustainable urban development and promoting cities’ partnerships. The UN-HBITAT Fukuoka Office is one of the organizations in Fukuoka that are working toward Fukuoka’s goal of becoming a center for policy-making in Asia. The City of Fukuoka, which recently bidded on hosting the 2016 Summer Olympic Games, was ranked among “The World’s 10 Hottest Cities” in the cover story of the June 26, 2006, issue of Newsweek International. Thus a visit to Fukuoka to explore its effective international strategies, including attracting the UN-HABITAT, will be highly instructive. The UN-HABITAT Fukuoka Office is delighted to offer a press tour on the World Habitat Day (the first Monday of October). The theme of this year’s World Day is “Cities: magnets of hope”. What sort of cities attract people and business? What is actually happening in Fukuoka, a rising international city? Fukuoka, reinforcing the World Habitat Day message, will reveal its strategies and initiatives that make it a magnet in Asia. The Northern Kyushu region has attracted Japan’s car giants to locate there. 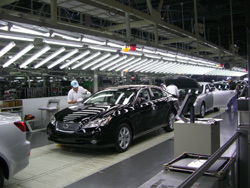 Most notably, Toyota Motor Kyushu Inc. in Miyawaka City, Fukuoka Prefecture, built the second top-of-the-line LEXUS production line on the basis of its own high technological standard. It has also begun manufacturing the next generation engine. Toyota Motor Kyushu, a wholly owned subsidiary of Toyota Motor Corporation, is Toyota’s second domestic manufacturing base and begun shipping completed vehicles to China from Hakata Port in January 2006. Surrounded by beautiful green forests, Toyota Motor Kyushu creates the world’s finest cars. The tour will include the Miyata No.2 Plant where production begun in September 2005, and where the “harmonizing cutting edge technology with excellent human hands and brains” concept, comes true. In addition to Toyota Motor Kyushu, the Northern Kyushu region is home to a Nissan factory in Kanda City, Fukuoka Prefecture and a Daihatsu production base in Nakatsu City, Oita Prefecture. Production by these 3 companies in FY2005 totaled 910,000 vehicles, and output is expected to reach 1.01 million in FY2006, since Toyota and Daihatsu are likely to increase production. Fukuoka Prefecture’s goal is production of 1.5 million vehicles in Northern Kyushu in FY2009 and is coordinating with Oita, Saga, and Kumamoto Prefectures to reach it. An issue for the area is whether they will be able to increase the ratio of parts supplied locally from 50% to 70%. A Fukuoka prefectural official will brief on the Northern Kyushu auto industry policy, including building the most advanced production base in Asia and developing the next-generation cars. 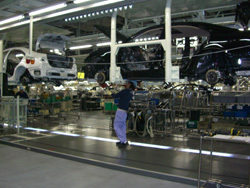 German automotive design giant Edag launched the first Japan branch in Fukuoka in May 2005. It currently has offices in 15 countries and 36 regions worldwide and works for such major clients as BMW, AUDI, VW, and Daimler Chrysler. It designs car bodies and components, develops manufacturing lines, and provides engineering services. Japan branch managing director Manfred Glotzbach will tell us why they chose Fukuoka and how they are building their strategy in view of the business climate in the Asia-Pacific region. Japan's IT giants, such as NEC, Hitachi, and Fujitsu, and foreign electronics companies, including computer manufacturers, have offices in this park. These companies are unusually active in forming alliances, a practice that is not so common outside Fukuoka. ISIT, established in 1995 as a core R&D body for the park, develops system LSI elemental technologies and coordinates between government, industry, and academia. Founded as a start-up firm by four persons, Sun, now the world’s leading computer server manufacturing company, has branches in 100 countries and 38,000 employees. It is famed for its Java technology. Sun is one of the Fukuoka Soft Research Park tenants. Fukuoka Branch President Akira Nakada will speak about his determination to come to Fukuoka to break away from the conventional Tokyo way of doing business and his commitment to the prefecture’s human resource development drive and projects to assist start-ups. 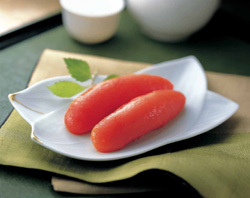 When you talk about a Fukuoka local delicacy, Hakata karashi-mentaiko, spicy cod roe, comes first to mind. The founder of Fukuya, Toshio Kawahara, was the inventor of karashi-mentaiko and devoted himself to spreading its method of preparation, not patenting it. The company was founded in 1949 and is currently led by the founder’s son, Masataka Kawahara: it has 600 employees. Kawahara is dedicated to preserving local tradition and culture, encouraging young employees to take part in the city’s festivals and events as a part of their education. 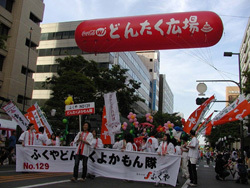 Fukuya symbolizes the generosity and hospitality of the people of Hakata, Fukuoka. They respect tradition but welcome peoples and cultures from other parts of the world. President Kawahara will brief us about the background behind the invention of karashi-mentaiko and his contributions to society. Fukuoka, gateway to the continent, has long prospered by developing trade with other Asian countries. Hakata, as its capital, begun as a commercial city that became a prosperous home to successful merchants. In 1897, the Hakata Silk Spinning Company, the forerunner of Kanebo, opened on what is now the Canal City site. The Yahata Iron Works also began operating in near by Kita-kyushu at the same time. Steel and silk were the symbols of Japan’s industrialization and Fukuoka’s success. But the silk spinning mill closed in 1959, and the 33,000 square-meter land was left vacant for decades. 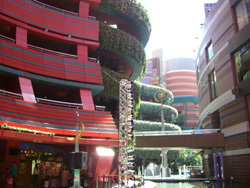 Canal City Hakata was born on the site in 1996 as a totally new type of commercial complex equipped with entertainment facilities: a shopping mall with a cinema and a theater. 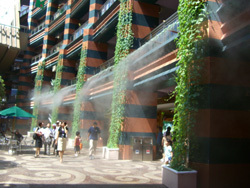 Canal City, now Fukuoka landmark, attracts many visitors from Asia. The redevelopment project, in which the revival of Hakata, a commercial capital in decline, was at stake took nearly 20 years to complete. People involved in the project went through tough times with the ups and downs of the Japanese economy between the late 70s and the early 90s. Vice-President Kennichi Tou of Fukuoka Jisho., Co.Ltd. will tell us the story behind Canal City’s birth and the keys to success in attracting people there. 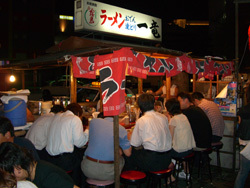 Fukuoka is often called a city of “Yatai”, or street stalls. Currently about 180 yatai are licensed to operate on the city’s streets, for an effect that seems more Asian than specifically Japanese. Thanks to efforts made by many people in Fukuoka, yatai are able to continue doing business in public places, but they also have problems to overcome if they are to have a brighter future. In this press tour, Kyushu University professor of urban engineering Hirofumi Minami will take participants to a yatai, where they can experience the characteristically intimate mode of communication between its owner and customers. We will hear from him about the history of yatai culture and yatai’s functions in terms of urban planning. Participants will also interview Mr. Yoshinobu Ando, Secretary-General of the Fukuoka City Yatai Union, on Yatai business now and in the future. This FM station, which started broadcasting in 1997, has listeners in the Northern Kyushu area: all of Fukuoka Prefecture, and parts of Kumamoto, Nagasaki, Saga, Ohita, and Yamaguchi prefectures. It airs programs in 10 languages, including Japanese, English, Korean, Tagarog, Spanish, Portuguese, Indonesian, Thai, and French. In the event of a disaster, it is prepared to provide information to local foreign residents by broadcasting the news in all those languages. 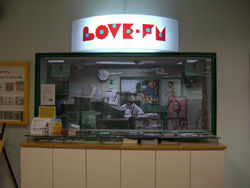 Love FM also sends Fukuoka musicians to events in Asia and invites Asian musicians to Fukuoka. We will pop in its studio in central Fukuoka. Launched in 1998, this monthly magazine in 6 languages (English, Japanese, Spanish, Portuguese, French, Chinese, and Korean) provides information for foreign residents and tourists in Kyushu and for everyone interested in international culture. It is distributed free of charge at 500 places in Northern Kyushu, including Fukuoka Airport, JR Hakata Station, and major hotels. The readers are mainly people in the 25 to 35 age range. Mr. Nick Sars, Editor-in-Chief and Secretary-General of the Fukuoka International Business Association, will join us at the reception. The tour arrives at Kita-kyushu Airport, which opened in March 2006, and departs from Fukuoka Airport for Tokyo. The participants will take the Fukuoka municipal subway to Fukuoka Airport so that they can experience its efficient and easy access. It is only a 15-minute-ride from the station in the Fukuoka Across Building where the UN-HABITAT Fukuoka Office is located, to the airport. On the way from Kita-kyushu (after visiting Toyota Motor Kyushu) to Fukuoka, the tour bus will drive along Hakata Pier. On the second day, participants will enjoy a Hakata Bay cruise to take a look at the Fukuoka waterfront area from the sea as well as to learn about the Port of Hakata’s roles and functions as a logistics center. 10:15-12:00 Visit TOYOTA MOTOR KYUSHU Co., Ltd.
14:00-15:00 Visit EDAG JAPAN CO., LTD. Presentation by ISIT and Sun Microsystems Co., Ltd.
*FPC will inform the participants of payment methods, cancellation fee etc. later on. 4. Participants: Limited to the first 10 applicants on a first-come first-served basis. (1) There are some restrictions on photographing and filming at the tour sites. Please follow the instructions of the officials on duty. (2) UN-HABITAT Fukuoka Office and FPC will not be liable for any inconvenience, trouble or accident that might occur in the course of the tour.